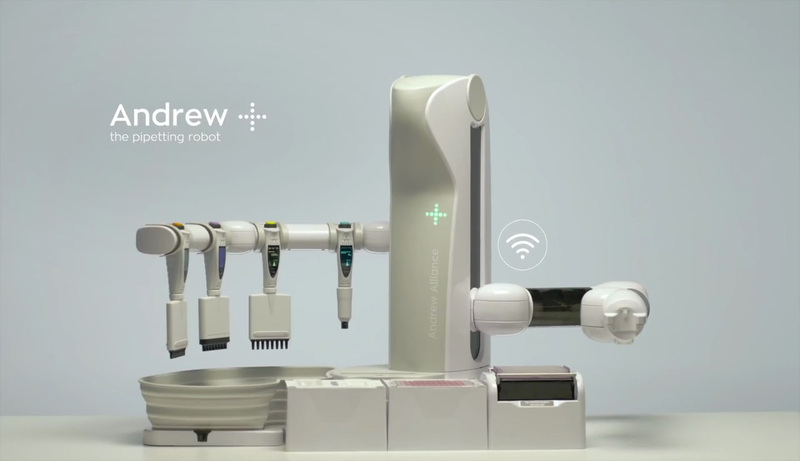 Andrew+ is based upon 5 years of market feedback from many hundreds of users, and builds on the success of the Andrew Pipetting Robot. It now goes beyond fully automated pipetting: it enables complex manipulation and grabbing of microplates, tubes and columns, and more through an expanding range of Andrew+ Accessories. Andrew+ is part of the OneLab ecosystems, executing protocols designed in OneLab. This architecture enables you to transition without effort from laborious manual procedures to error-free,fully-robotized workflows – without any knowledge in robotics or programming automation. Reproducibility and full traceability of experiments is assured using this highly an intuitive browser-based software environment. OneLab enables users to graphically design their own pipetting protocols in minutes and execute them straight away on your preferred platform, even allowing the remote monitoring of ongoing experiments. Andrew+ use single & multichannel electronic pipettes, for the best performances and maximum flexibility. The Andrew Alliance smart electronic pipettes are manufactured by Sartorius upon their acclaimed Picus range. Any Andrew Alliance pipette can be used by the Andrew+ pipetting robot, allowing a great flexibility in the type of experiments to be run, guaranteeing superior reproducibility, speed and a unique dynamic range of liquid volumes – from 0.2 µL up to 10 mL. The system has been designed to fit the majority of laboratory benches and hoods. Andrew+, even with 2 full rows of Dominos (allowing to use 7 microplates or 56 falcon tubes or 168 microtubes) occupies a depth of ~60cm/24”, that fits even the smallest hoods. Its compact size and design also allows to locate it in a refrigerator, and work at 4°C temperature. In addition to pipetting liquids, Andrew+ can perform a wide range of complex experiment steps such as tube/microplate grabbing, and chromatography column preparation. The use of different tools by the Andrew+ arm is further supported by an ever-expanding range of Dominos: a modular solution to adapt Andrew+ to a large number of consumables, connected Dominos can perform shaking, heating and other operations. Laboratory automation eliminates most human errors resulting in more reliable data and improved productivity. Together with complete integration inside OneLab, all experimental data from Andrew+ will be recorded and stored, improving the traceability of experiments and the data analysis. Andrew+ uniquely combines the flexibility of single channel pipetting (0.2 μL to 10 mL) with the higher throughput of multichannel pipetting. This is not possible with most commercial liquid handlers. In addition, Andrew+ reduces the need for additional experiments due to pipetting error. Pipetting requires repetitive movements (of up to 500 times per day for the average user) that can lead to musculo-skeletal disorders like repetitive strain injury. Andrew+ eliminates physical stress to professionals, and also reduces the risk of exposure to hazardous materials used in certain experimental procedures. The pipetting robot using conventional electronic pipettes, allowing any scientist to move to automation without any robotics knowledge. Unique software solution that allows scientists to design and execute laboratory protocols. Electronic pipettes made smart by connectivity. Maximum repeatability, minimum of effort.